That’s a quote from a recent interview with New York Times bestselling author Susan Casey who will be here on Nov. 18 at the City Opera House. 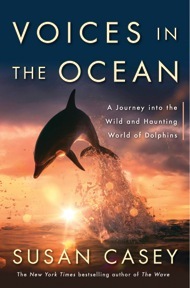 Her book is both fascinating and disturbing, as she goes from current science to a bit of the woo hoo, to the dangerous and dark parts of the world where dolphins are slaughtered, eaten, or sold into captivity. You won’t want to miss this one! For tickets, please call 231-941-8082, buy online, or, for lowest fees, go to the City Opera House Box Office on week days at 106 E. Front Street.